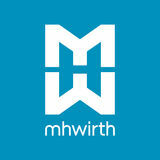 MHWirth has a global reach covering five continents with offices in 13 countries. Drawing upon our global market success, we continue to seize opportunities through an established strong regional presence. Our dedicated professionals consistently strive to enhance customer satisfaction and form meaningful collaborations by creating a personalized experience. Performance With a Purpose MHWirthâ&#x20AC;&#x2122;s values are a testament to our commitment to each other, our customers and our stakeholders. We strive for excellence without compromising on integrity. These six values serve as a roadmap towards cultivating a positive workplace and fulfilling our corporate strategy with pride. Our brand proposition is empowered through the consistent adoption of these values. MHWirth Training Center MHWirth provides proven training that is built on a strong pedagogical foundation and developed over years. We have highly qualified instructors with years of relevant experience in all the fields covered by our courses. This results in high quality training delivered in a global and uniform way. MHWirth is organized with regional centers located all over the world. With our global training perspective, we are able to meet the customers where it is most convenient for them. With our four regional hubs in Europe, USA, Brazil, Azerbaijan and Singapore, we are located close to most of the operating drilling rigs and perform training where our customers prefer. If a rig is moving, we are able to start the training in one location and continue from another. Our organization consists of regional training managers, course coordinators and planners and highly qualified instructors. We also have a professional production department, where we produce course material (textbooks and instruction material) and eLearning courses. We work closely with our customers in order to understand their needs and to provide them with the best possible training services. Why is training so important? Professional training and competence are key success factors in maximizing uptime and ensuring the safe and efficient operation of drilling equipment and drilling rigs. Just as important, an extensive and realistic training program will increase the profit of the drilling rigs. A well performing crew will utilize the equipment in the best possible manner, resulting in increased uptime and reducing wear and tear on the machines. Potential results of an untrained crew working with complex machinery and systems are poor performance, equipment problems and serious incidents. This is just the beginning of a list of issues that can be greatly minimized with the correct training. Our Training Concept A well trained crew is essential in order to optimize rig performance. A harmonized crew, from operators in the driller’s chair to maintenance personnel, will keep the rig operational. By making the training rig specific at all levels and as close to real life as possible, we provide personnel with the possibility to be ready for action without any delay. Trained personnel will be able to prevent down time as well as reduce the time needed to get the rig up and running if incidents occur. Pedagogical foundation The variability in personality and learning styles among the training center’s course participants is large. Achieving the best possible skills and competence to operate and maintain MHWirth’s advanced drilling equipment are critical in order to achieve safe and efficient operation of the rig. We take these pedagogical challenges seriously and have developed a training concept that meets these challenges. Our excellent facilities provide the perfect learning tool for our skilled instructors and enable us to offer customers a good learning experience. With advanced technology, we are able to provide practical training that realistically matches the equipment and the challenges the employees meet on a rig. Our facilities are standardized all over the world so the participants and instructors meet the same technology and design regardless of the course location. Our facilities ■■ Well-equipped classrooms ■■ Full-scale simulators ■■ Single-equipment simulator ■■ Technical training laboratory (TTL) We are able to offer training onboard the rig, in our workshops or at other locations when it is appropriate and beneficial and in close collaboration with the customers’ needs. Full-scale simulators Our full-scale simulators give a unique opportunity to train personnel in a rig specific and realistic environment. The simulators have a full scale human-machine interface (HMI) to match the equipment and the operator interface you meet on a rig. Our simulators use advanced software and high-quality animation technology to provide 3D visualization. 3D models are imported directly from engineering systems and connected to the actual control system. Enrollment Course language The standard spoken language in all our courses is English. By inquiry, courses can be carried out in other languages. Facilities Our classrooms are fully equipped with modern technology to ensure the best technical understanding for the course participants. We have three projectors in each classroom and use smartboards and whiteboards to illustrate equipment and to show animations, pictures and films. Lunch and refreshments are included in the fixed course rate. Travel time and accommodation expenses are not included in our prices. Terms and conditions Participants must sign up for the course at least three (3) weeks prior to the course start date. MHWirth reserves the right to cancel a course if less than six (6) participants have signed up two (2) weeks prior to the course start date. Target group Operators working in relation to the HRN 1898. Prerequisite skills and knowledge The students are expected to have some operational experience. Course capacity The maximum number of participants is 12. Course duration 1,5 days. Target group Operators working in relation to the HRN 1899. Prerequisite skills and knowledge The students are expected to have some operational experience. Course capacity The maximum number of participants is 12. Derrick Drilling Machine (DDM) 650/750 The course gives an understanding of how the MHWirth derrick drilling machine functions, its operating philosophy and how to operate and perform first line maintenance and troubleshooting in a safe manner. The students are expected to have a technical competence and some operational experience from a rig in operation. The course aims to increase the theoretical understanding of how the machine is functioning and how to operate it in a safe manner. Course capacity The maximum number of participants is 12.
shooting in a safe manner. Students (personnel) are expected to have basic operational and technical understanding and are expected to understand technical English. The student shall after classroom information and self-study: Understand the use of the MHWirth Manrider winch, as well as the operating philosophy, technical functionality, safe operation and first-line maintenance. The course is held in the English language with course material in English. Theoretical and practical training is to take place in a classroom. Target group All personnel working with the drillstring compensator system. Prerequisite skills and knowledge The students are expected to have a technical competence and some operational experience from a rig in operation. Direct Acting Tensioner (DAT) The course gives a good understanding of operating philosophy of the direct acting tensioner system, including how it functions and how to perform first line maintenance and troubleshooting. The course gives a theoretical understanding of how the direct acting tension system functions, and operating it in a safe manner. Couree topics ■■ HSSE ■■ Functional description ■■ Operational description ■■ Periodic maintenance ■■ Theoretical test Target group All personnel working with the direct acting tension system. Crown Mounted Compensator (CMC) The course gives a good understanding of operating philosophy of the crown mounted compensator, including how it functions and how to perform first line maintenance and troubleshooting. This course includes both active and passive compensating. The students are expected to have technical competence and some operational experience from a rig in operation. The course gives a theoretical understanding of how the crown mounted compensator functions, and operating it in a safe manner. Basic Familiarization This introductory-level course is suitable for all job disciplines at all levels. It can serves as a good primer for new staff positions. The course is designed to provide the participants with a basic understanding on the types of equipment delivered by MHWirth. The participants are shown where the equipment is located onboard a typical drilling rig; and the basic functions and operations are explained. At the end of this course, the participant will be able to: ■■ Recognize the different type of offshore rigs and the drilling components. ■■ Identify and locate the different MHWirth equipment on a drilling rig and explain the basic functions of the equipment. ■■ Relate the equipment’s application to actual drilling and safe operation. Technical Training Laboratory (TTL) The TTL is a training lab well equipped with tools and diagnostic equipment, as well as example equipment and full scale drilling equipment machines. Our TTL’s are located in: ■■ Kristiansand, Norway ■■ Erkelenz, Germany ■■ Katy, USA The lab is built for safe training of maintenance personnel, with both an electro/instrument and hydraulic background. This type of training on components are very valuable for employees who plan on working with MHWirth equipment. Training in the TTL means ■■ hands-on training on MHWirth live systems equivalent to those found on a drilling rig ■■ tailor-made training for both electro/instrument and hydraulic personnel ■■ an in-depth understanding of the most commonly used components on our equipment We offer realistic work tasks closely connected to situations that could occur on equipment on a rig in operation, but without the harsh consequences of failure. Participants who have been through such cases in a safe training situation will be better prepared to handle the problem safely and more effectively. Through courses in the TTL, hydraulic and electro/ instrument personnel also learn more of each other’s fields, and will be better able to communicate and collaborate when troubleshooting on a rig. During a typical week in the TTL, the electro/instrument personnel and the hydraulic personnel will work in pairs to solve tasks given by the instructors. We start on the component level, building up to tasks involving combined components as the course progresses. The participants will learn how to adjust, connect and set up the specific components on the machines, and by the end of the week they will work on full-scale machines. Target group Electro/instrument personnel and hydraulic personnel. Introduction to Drilling Overview Theoretical classroom training about drilling basics. Course description and learning objectives ■■ Give a basic understanding of the different drilling units in use, the drilling operation and tools in use for drilling an oil well. ■■ Give the students a basic understanding of the equipment, design and operational sequences applicable for a typical offshore drilling rig. After this course you will have a general understanding of drilling operations and the applied technologies. Training content ■■ Introduction to Drilling (History, Geology) ■■ Rig types ■■ Drilling equipment ■■ Operational sequences ■■ Drillsting components (inkl BHA and Rotary Steering Systems) ■■ Casing and Cementing ■■ Drilling Fluid System ■■ Well Control Duration 1 day Course capacity min. 5 participants max. 12 participants Target group All job professions Language Training execution and digital training material will be provided in English language. Prerequisites No prerequisites required. This is an open-class training. The training content is not project specific or customized. In this training package you will learn ■■ The basic knowledge about the functionality of the different main components and their hydraulic systems. ■■ The features and functionality of the different control systems DICS, ZPS, DBS, ECS and ADS. ■■ How to execute routine and safety relevant maintenance work considering maintenance procedures, WKI documents and HSSE mindset. ■■ How all components mechanically/hydraulically interact and how the failsafe philosophy is realized. ■■ How to operate the multi-gear drawworks using IOC touch panel and joystick in different gears, setting working points and tool compensation as well as executing ZPS calibration run and using autodriller features. ■■ To understand the complex control processes, their failsafe philosophy and how the control systems communicate and interact to each other. ■■ How to execute maintenance work, based on relevant documents, safe and correctly. Training execution and digital training material will be provided in English language. This is an open-class training. The training content is not project specific or customized. Course description and learning objectives Electrical maintenance personnel shall be able to carry out troubleshooting on multi-gear drawworks control software and HMI more effective but without in depth knowledge about the software functionality. This course covers theoretical classroom, practical TTL and simulator troubleshooting training. After this course the participant shall be able to use failure & help messages, technical drawings and documentation for failure analysis in order to provide our 24/7 technical support hotline the required information in a professional manner. Furthermore the participant shall be able to monitor interface signals of control systems via ServiceLab/HMI. This course module is based on monitoring software ServiceLab 9. The training content for ServiceLab 9 is limited on monitoring of determined software interfaces but not the handling of the complete software. Theoretical introduction into hydraulic basics. Prerequisites General technical and physical basic knowledge. In this course you will learn the technology, functionality and operation of the Pump Monitoring System as well as the understanding how the monitored data curves and fingerprints are being analyzed. After this course module you know all main components and specifications. Furthermore you understand how the analysis and interpretation works. You will be familiar with the operation of PMS software. Course description and learning objectives In this training package you will learn ■■ The functionality of the different main components and their hydraulic systems. ■■ The functionality and features of control system DCS and PCS. ■■ How all components mechanically/hydraulically interact and how the slurry pump works. ■■ How to operate the slurry pump using local control panel LCP. ■■ How to execute maintenance work, based on relevant documents, safe and correctly. Language Training execution and digital training material will be provided in English language. Prerequisites ■■ General technical and physical understanding ■■ Basic hydraulic knowledge is recommended ■■ Basic electrical knowledge and ability to read electrical schemes and instrumentation diagrams is required. Optional add on training modules All open-class product training modules Prerequisites Participation on open-class training modules for multi-gear drawworks, mud pump or rotary table is required. In this training module you will learn how to execute brake bedding according to maintenance procedure. After successful participation on this course module and passed test you are certified to carry out brake bedding on a multi-gear and single-gear drawworks independently. Course description and learning objectives In this training package you will learn ■■ The basic knowledge about the functionality of the different components and their hydraulic systems. ■■ How all components mechanically/hydraulically interact. ■■ How to operate the rotary table in different speed and direction using IOC touchpanel. ■■ How to execute maintenance work, based on relevant documents, safe and correctly. Language Training execution and digital training material will be provided in English language. Prerequisites General technical and physical understanding and hydraulic knowledge is recommended. Conventional Rig Simulator MHWirth simulators offer a unique opportunity to train personnel in a realistic environment. The course gives a good understanding of MHWirth drilling and pipehandling equipment operating philosophy. 5 days Course goal The course aims to increase the understanding of MHWirth’s operation philosophy, how the drilling and pipehandling equipment functions, and how to operate it in a safe manner. This is achieved through theoretical and practical training using a typical conventional rig training simulator. Course topics The main topics for the course are: ■■ HSSE ■■ Introduction to operator chair, DrillView, smart zone management system and review of operational sequences. ■■ Pick up sequence ■■ Lay down sequence ■■ Trip in sequence ■■ Trip out sequence ■■ Drilling connection ■■ Backreaming sequence ■■ Standbuilding sequence Target group Operational personnel on the rig: ■■ Tool pusher ■■ Driller ■■ Assistant driller ■■ Derrickman/assistant derrickman ■■ Roughneck Prerequisite skills and knowledge The students are expected to have some operational experience from a rig in operation. RamRig Simulator MHWirth simulators offer a unique opportunity to train personnel in a realistic environment. The course gives a good understanding of MHWirth’s drilling and pipehandling equipment operating philosophy. 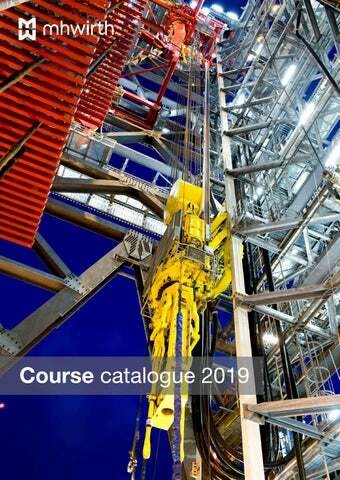 Course goal The course aims to increase the understanding of MHWirth operation philosophy, how the drilling and pipehandling equipment functions, and how to operate it in a safe manner. This is achieved through theoretical and practical training using a typical RamRig training simulator. The students are expected to have some operational experience from a rig in operation. Downhole Awareness The objective of the course is to give students a good understanding of Downhole problems and to practice corrective procedures and practices so to avoid the train wrecks offshore. PLC1996 Remote Diagnostic The course gives an understanding of the Remote Diagnostic service and the PLC 1996 software. After classroom instruction and self-study, the student will: ■■ Be able to use Simatic Manager for machine fault-finding (PLC1996) ■■ Have knowledge about 24/7 support and Remote Diagnostic services. Target group Electrician/ET-personnel, Electrical supervisor/chief. Prerequisite skills and knowledge The students are expected to have experience from the rig. The students are expected to have basic PC knowledge. PDPH Operator The course provides a combination of theoretical training, simulator- and offshore training, with focus on system understanding and safe operation of the machine. Course goal The learning goal is to give the participants understanding of the PDPH, as well as the operating philosophy, technical functionality, safe operation and first-line maintenance and troubleshooting. Tailor-made Training The MHWirth training center’s philosophy is based on a four module training program that targets all relevant personnel groups and covering all their different job requirements. ■■ 4 days for maintenance personnel. Max number of attendees 12 per class. Training location We offer a full training program in Kristiansand, Norway. Classroom and simulator training can also be provided in Stavanger, Norway as well as Macaé (Brazil), Houston, (TX), Singapore and Korea. The eLearning program is done on a personal computer with Internet connection at home or at work. For drawworks, mud pump and rotary table, training will be provided in Erkelenz, Germany. eLearning With a preparatory eLearning package, we know that when the participants have started their learning process, they will learn more and keep the knowledge for a longer period. Since eLearning usually is issued weeks or months before the classroom sessions start, each participant may use the necessary amount of time to harmonize with the learning goals before further training starts. Classroom training With our experienced instructors, and use of modern technology and material, the classroom training is an excellent and safe way to provide the students with a technical and theoretical understanding. Animations and films, in combination with skilled instructors, engage the participants in the classroom. This facilitates transfer of knowledge in an excellent way. High quality textbooks and a Rig Stick (USBstick) are handed out to the participants. The Rig Stick includes sequence animations, films, pictures, documentation and textbooks. Training packages for drawworks, mud pump and rotary table Drawworks training ■■ 4 days for all personnel but customized for electrical, mechanic/hydraulic or operational personnel. Max 6 attendees per class. Mud pump training ■■ 3 days for all personnel but customized for maintenance or operational personnel. Max 12 attendees per class. Rotary table training ■■ 1 day for all personnel but customized for maintenance or operational personnel. Max 12 attendees per class. Training package for mud mixing, solid control and choke & kill Introduction course ■■ 1 day for all personnel, maximum 12 attendees per class. Equipment course ■■ 1 day for all personnel, maximum 12 attendees per class. Simulator course ■■ 1 day for all personnel, maximum 12 attendees per class.